Southside Christians are in love with Jesus Christ, and we hope it shows in every aspect of our lives. Our services are warm and friendly, and we welcome new folks into the fellowship. Worship services on Sunday are blended with choruses and hymns so there is some kind of music for everyone. Several different people lead in various aspects of the service according to their gifts. There is a variety of rousing and reverent. As a New Testament Church, we practice the LORD's SUPPER each and every first day of the week. We hold scripture in high regard, therefore the preaching and teachings are based upon the WORD of GOD. Southside Christian Church has fellowship with Christian Churches and Churches of Christ worldwide although there is no denomination headquarters or official organization that dictates doctrine or policy.....we are "non-denominational." Southside folks want to be growing and serving the Lord. We want to reach out into the community to meet needs and share the love of Christ. Ours is a great message of healing and hope, something our world really needs. It is our belief that God wants His Church, Southside Christian, to grow spiritually and numerically toward maturity in Christ. This is a scriptural admonition. Curt and his wife, Sarah, have served as our ministry family since 1987. Curt is originally from Annapolis, Maryland, and Sarah grew up on a dairy farm near Lake Okeechobee, Florida. Curt received his education from Florida Christian College (now Johnson University Florida) in Kissimmee, FL, and from Cincinnati Christian University. Sarah has degrees from Florida State University and the University of South Florida, and is currently teaching in the Sarasota County Public School System. Curt's hobbies include restoring old military vehicles, and Sarah loves cooking, reading, and cats. Southside Christian Church began its journey of evangelism in 1962. Much before then, however, eleven people launched the effort to establish this new church, one more clearly patterned after the New Testament. During 1960-1961, Mildred Hill and Bonnie Sharp met with local area ministers from St. Petersburg, Wauchula, Clearwater, Lake Wales, and Ft. Myers to finally get support to start the church, originally known as Southside Christian of Sarasota. Space was rented at the Elks Club behind Riverview High School as a temporary location to hold services. The inaugural service was held Sunday, March 18,1962,with fifty-one persons attending and nine persons placing their membership. The first baptisms were done in Philippi Creek. John Mullins, an Elder from the Central Christian Church in St. Petersburg, drove over to preach and lead the original congregation until September of 1962, at which time Roland M. Lotridge was called to be the first full-time minister. The current church property on Webber Street was donated by Mrs. Isabel Avary, and bonds were sold to the church members for the construction of the buildings. In 1965, the 250-seat sanctuary, social hall, kitchen, two restrooms, and minister’s study were built and furnished at a cost of less than $50,000.00. Tom Myers and Ernie Coven, both elders, contributed greatly to the building and oversight. Mr. Coven was honored with the key to open the door for the first service. There was a full week of services scheduled for the dedication of the new church building on Webber St., beginning with the actual dedication ceremony at 3pm on Sunday, March 28,1965, and a special service each night through Friday. In later years a new office complex was built, the fellowship hall enlarged, two wings of classrooms added, and the sanctuary remodeled. More recently the kitchen has been remodeled. Roland Lotridge retired as the minister in September of 1978, continuing to attend until his passing in 1999. The second minister was Robert E. (Bob) Miller who served until 1987. 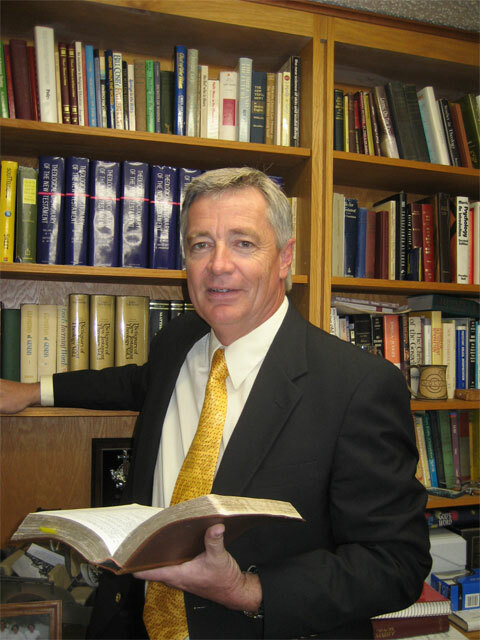 Curt Leonard, the current minister, has been faithfully serving the church since that time. Southside has helped start two additional area churches since its founding: Parkway Christian Church (now Whitfield Christian Church), 1989, and New Hope Christian Church in Osprey,1997.